Thinking about volunteering as a lacrosse coach? Even if you`ve never done it before, you can lead your team to a safe and exciting season. 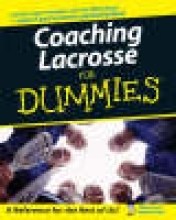 Coaching Lacrosse For Dummies shows you the fun and easy way to get the score on coaching youth lacrosse with loads of tips and plenty of offensive and defensive drills. Part I: Gearing Up to Coach Lacrosse. Chapter 1: Teaching Lacrosse to Children. Chapter 2: Setting the Stage for a Successful Season. Chapter 3: Covering Basic Lacrosse Rules. Chapter 4: Parental Guidance: Meeting Your Players’ Parents. Part II: Fielding a Lacrosse Team. Chapter 5: Managing Your Team. Chapter 6: Conducting Fun-Filled Practices. Chapter 7: Getting with the Drills. Chapter 8: Making Game Day Memorable — For the Right Reasons. Part III: Basic Training: Teaching Lacrosse Skills. Chapter 9: Scoring with Offensive Fundamentals. Chapter 10: Setting Defensive Fundamentals. Chapter 11: Playing Lacrosse Offense. Chapter 12: Playing Lacrosse Defense. Part IV: Net Gains: Advanced Lacrosse Coaching. Chapter 13: Refining Your Coaching Strategies. Chapter 17: Staying Healthy and Injury Free. Chapter 18: Challenges Every Lacrosse Coach Will Face. Chapter 19: Coaching a Lacrosse Travel Team. Chapter 20: Ten Qualities All Good Lacrosse Players Possess. Chapter 21: Ten Ways to Prepare Players for a Lacrosse Game. Chapter 22: Twelve Tips to Help Goaltenders Excel in the Nets.